Kate rocks gold-winning look in Alexander McQueen at Olympic reception | HELLO! Looks like the Duchess of Cambridge, née Kate Middleton, has another gold-worthy look under her belt! The royal looked pretty in poppies as she stepped out on Tuesday evening for an Olympic reception held at Buckingham Palace. The 34-year-old showed off her Team GB pride for the occasion, sporting a poppy-printed silk gown by Alexander McQueen. The ankle-length designer frock featured a cinched waist and bunches of poppies printed throughout. Kate accessorized the long-sleeve dress with her bordeaux Gianvito Rossi suede pumps and a matching clutch bag. The royal wore her glossy locks down in loose waves instead of sticking with her recent elegant updos. 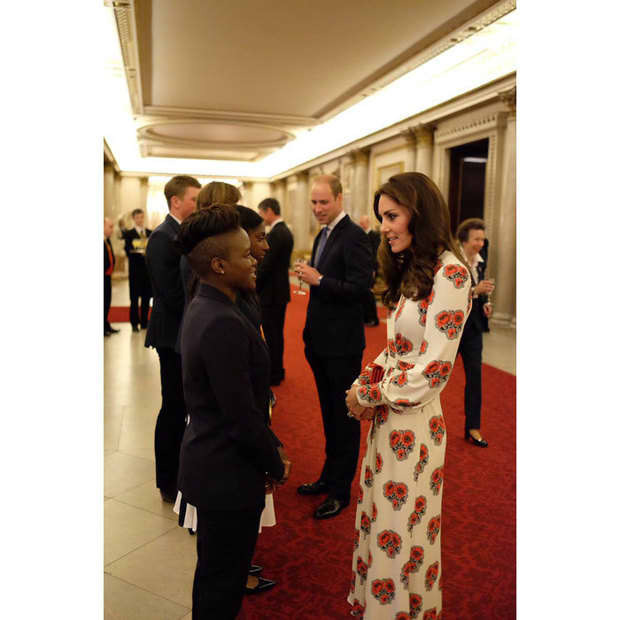 The mother-of-two, along with her husband, Prince William, were on hand to honour Team GB Olympic and Paralympic medalists at the Queen’s London residence. The Duke and Duchess chatted with Olympians, looking at their gold medals. Prince George's parents were joined by a number of royal relatives at the reception including Prince Harry, Queen Elizabeth, Prince Andrew and Princess Anne.